Tickets available here beginning 2/15 at 9 a.m. This season’s Young Artists Concert will feature students from the College of Charleston Jazz Program. The CofC Jazz Program provides students with outstanding skills in jazz performance, a strong background in jazz improvisation, theory, arranging and composition, as well as practical performance opportunities, in an experiential learning environment. All members of the faculty are working professionals in the jazz field. This “real world” experience – whether touring the world with big name acts or leading their own more regional groups – informs the instruction of the next generation of jazz professionals. Faculty members Robert Lewis, Quentin Baxter and Gerald Gregory are familiar to Arts Council audiences – these and other faculty provide students with individual and group learning experiences. 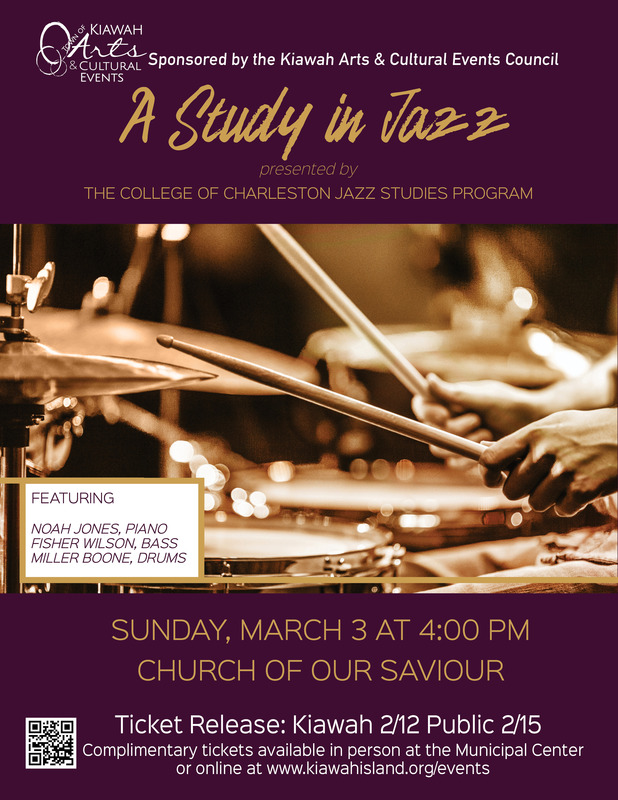 Student jazz ensembles are created and perform outside of the College during many of the various music festivals held in Charleston throughout the year. What could be better for an aspiring young jazz player than individualized instruction by some of the best players in the field, combined with plenty of performance opportunities! Robert Lewis, Director of the Jazz Studies Program, has selected one of his stellar ensembles, consisting of Noah Jones, piano; Fisher Wilson, bass, and Miller Boone, drums to perform for Kiawah. The Arts Council is pleased to present these student musicians, who are already regularly playing professionally in the Charleston jazz scene.